Week 5 | Whole Food. Real Food. Good Food. Week 5: We replaced our table salt with Himalayan Pink Salt. Himalayan Pink Salt is nature’s healthiest salt — it is the purest salt in the world. Free of bleaches, preservatives or chemical additives, it has a natural pink color and 84 minerals and trace elements such as: calcium, magnesium, potassium, copper and iron. Regular consumption of Himalayan Pink Salt provides essential minerals, trace elements, balances electrolytes, supports proper nutrient absorption, eliminates toxins, balances the body’s pH, normalizes blood pressure, and increases circulation and conductivity. It can also assist with relief from arthritis, skin rashes, psoriasis, herpes, and flu and fever symptoms. Unlike table salt, Himalayan Pink Salt contains no anti-caking agents or preservatives of any kind. Regular table salt is “actually full of many forms of chemicals and even sugar”, according to natural health website Global Healing Center. This type of salt is difficult to digest and can lead to inflammation of the tissues, high blood pressure and bloating. 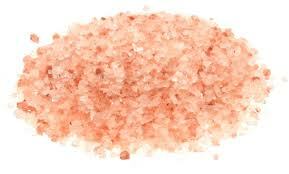 Himalayan pink salt is easier for the body to process, requiring far less cellular water in order to neutralize the sodium chloride content in chemically-treated salt. You can use Himalayan Pink Salt as you would any table salt. We use it for all of our cooking and baking too. * Heated to 1200 F * Hand picked. Sun dried. An acid body is a magnet for sickness, disease, cancer and aging. Eating more alkaline foods helps shift your body’s pH and oxygenates your system. Alkaline foods keep your body healthy and functioning correctly, preventing and combating cancer. This salt will help keep your body’s ph balanced, thus help prevent disease! Read more about the benefits of Himalayan Pink Salt here. We keep our salt (and pepper) in little pinch bowls which makes it easy to sprinkle when cooking. With this simple change and the change to coconut oil, your organic fried eggs will be so much healthier in the morning! We also throw a handful of fresh organic spinach in the skillet while our eggs are frying. Flip the spinach and eggs together and you have a delicious healthy breakfast. Pingback: Crock Pot Bone Broth | Whole Food. Real Food. Good Food.